Siren 2's development team were insistent upon creating everything possible, such as people and items, out of CG based on photographic data. That care was, naturally, applied to the ruins that back up the background of the whole story as well. Just like when the first game was being developed, the staff travelled to and looked around ruins, abandoned mines and schools, etc. nationwide, and brought back a huge amount of photos with them. These real-life ruins served as the basis for level creation. It is also due to being able to feel their unique atmosphere, as if left behind by time, that they have the possibility to express such realism. 01 - The details of Yamijima come from research conducted in places like this theme park. 02 - Scenery you might see anywhere in Japan... Several of the impressive locations that appear in Siren 2 are supported by this combination of realism. In particular, the staff focused on the depictions of huge, concrete ruins in this game. In the first game, set in a mountain village, they worked hard on the abandoned wooden buildings, but in Siren 2, a large theme is huge industrial buildings made of concrete. Because of this, they chose Hashima, an island off the coast of Nagasaki, to research. Since the Meiji period it had been a mining island where coal was mined, earning the nickname "Gunkanjima" due to the appearance given to it by its fortified concrete seawall, and it is obvious that it served as the model for Yamijima. However, due to being battered by the elements for many years, the general public are forbidden from setting foot on Gunkanjima due to the danger of collapsing buildings. This meant that, aside from getting up close to the island by taking a cruise around it, they mainly reproduced the island's details using books and photo albums. These various approaches were used to create the realism of the rust-covered and rotting steel framework and concrete eroded by rain water, amongst other things. 03 - The majestic appearance of Gunkanjima as viewed from a pleasure cruise ship. The concrete seawall, hardening the area, and angular buildings give the image of a battleship, or "gunkan". 04 - The rusted body of an abandoned truck also turned out to be important data. They also performed detailed research on the equipment of the JSDF soldiers who are properly introduced in the game. Aside from looking into the usage of guns and their behaviour and language, so nothing would appear out of place or unnatural, they also had assistance from the editors of Arms Magazine Monthly (Hobby Japan) for reference with particular regard to guns. A snap taken when the Siren 2 development team visited the Self-Defence Force to conduct research. The satisfied smile of Director Toyama, standing in the centre, leaves a mark. By the way, passionate players of Siren 2 should recognise this photo from somewhere. The picture is actually the same one used on the top tight page of archive no.057 "SDF PR Magazine 'Devotion'". 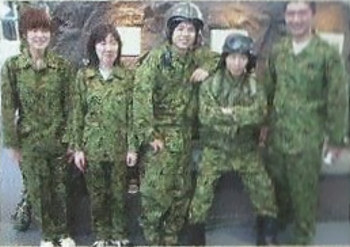 Mr. Toyama commented: "From the photo you kind of get the feeling, 'Hey, there can't be such weak-looking JSDF members!' (laughs)."